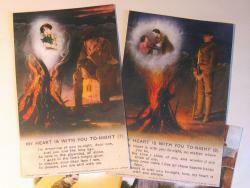 Replicas of a set of 4 different early-war period romantically themed original postcards. "MY HEART IS WITH YOU TO-NIGHT". Tommy dreaming of his sweet-heart back in blighty. Full colour, blank reverses.